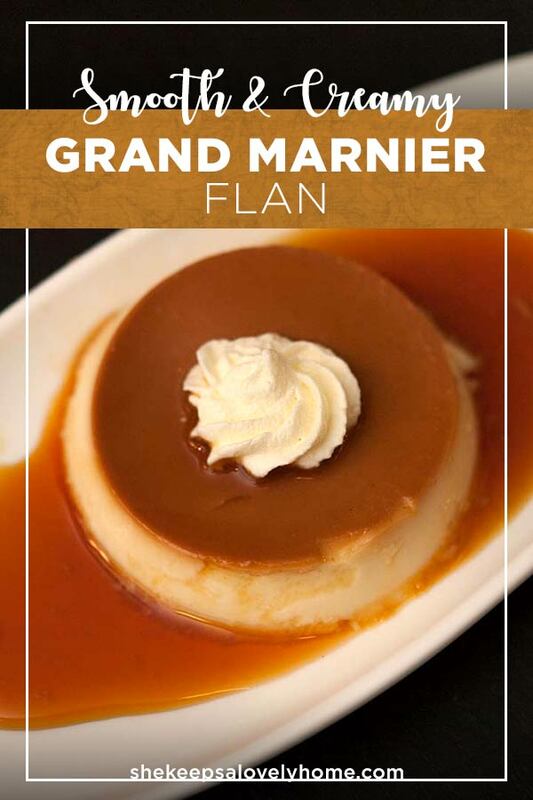 This glorious Grand Marnier flan is so smooth, so creamy and not “eggy” at all. 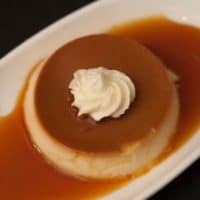 It’s a delicate custard with just a hint of orange essence, complementing its dreamy, caramel goodness. 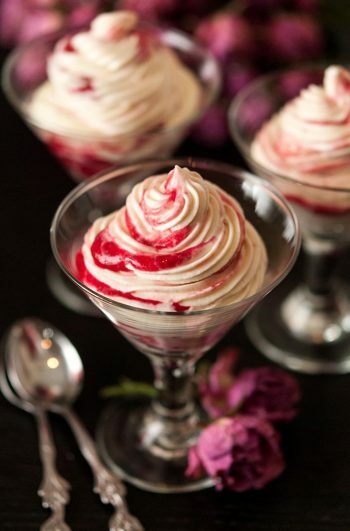 I made this dessert for a Baby’s Breath-Inspired dinner party and I was a little nervous that it would be too rich a dessert to pair with my very rich rich dinner. It was actually perfect! Even though it’s full of flavor, its texture is so delicate and silky smooth that it feels light. I topped it with a little fresh cream and served it with a lovely dessert port. *Important note! 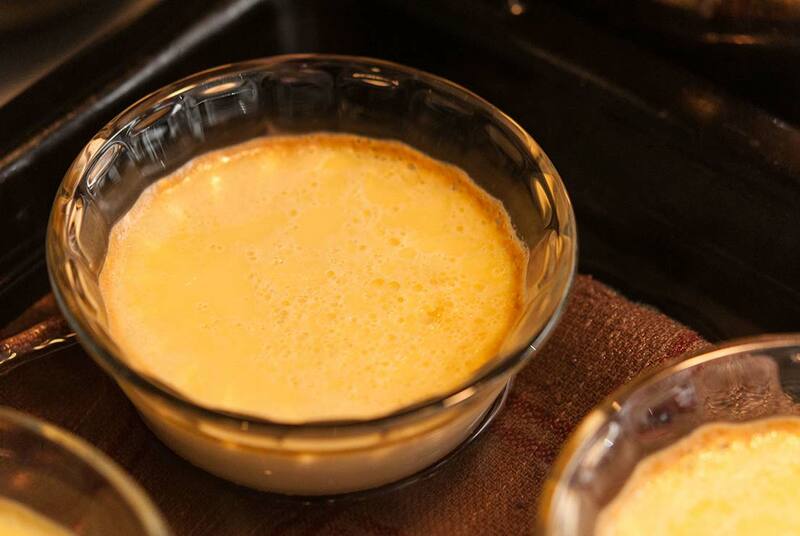 You’ll want to make this flan 24 hours before you intend to serve it. It needs at least a day (if not 2) for the caramel to infuse the custard. Preheat your oven to 320, and create a “bain marie.” Lay a towel into the bottom of your pan, and place your ramekins on top. Fill the pan with water about half-way up the ramekins. The towel will prevent them from sloshing around in the water. Set aside. 1. Combine 3½ tbsp. of water and 1 cup of sugar in a saucepan to make your caramel. This process will take about 10 minutes. Heat over a medium flame and let it start to bubble. Resist every urge to stir it. (I have a hard time with this. I just want to stir it so much, but it doesn’t help). 2. After about 6-7 minutes, the color of your caramel will appear to have a golden blonde color. This is when you want to add your Grand Marnier. Pour quickly, pick up the sauce pan and swirl the pan fast. You want it to steam off a bit. Swirl for about 15 seconds, and return the pan to the flame. 3. Watch the color of the caramel closely. When it appears to be darkening to a deep cherry brown, quickly lift the pan and swirl again. The sugar will continue to cook in the pan even when it’s not over the flame and burns quickly if it’s left too long. 4. Once your caramel is the color of a warm mahogany, pour it into your ramekins. 5. Pour your whole milk and vanilla extract into your pot and heat to almost boiling. Stirring occasionally. Whisk 3 eggs into a measuring cup or bowl with 6 tbsp. of sugar. Pour the sugar/egg mixture through a mesh strainer to strain out any extra eggy bits, and return to your cup or bowl. Slowly (very slowly) pour your sugar/egg mixture into your milk while constantly stirring with your other hand – otherwise the eggs will simply become a scrambled egg mixture in the milk. 6. To ensure your flan is extra smooth, strain the entire custard mixture through your mesh strainer and then pour into your ramekins evenly. Place on the bottom rack, and bake for 45 minutes to an hour. 7. 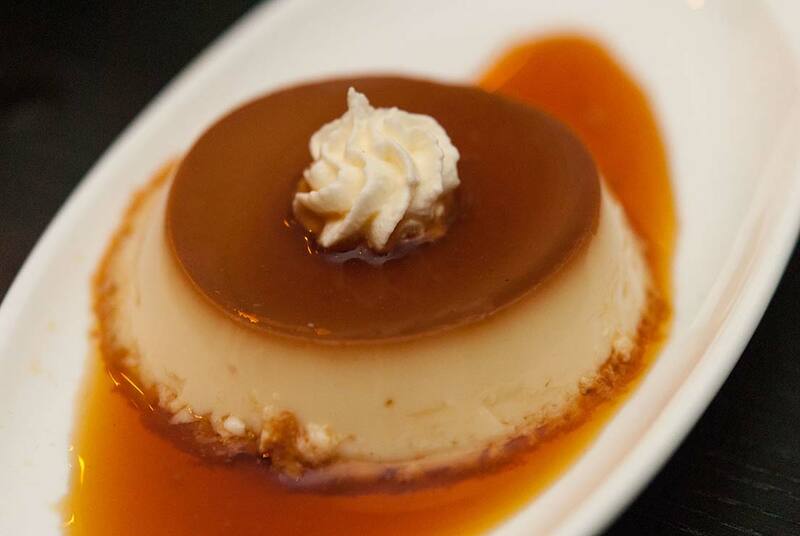 You’ll know your flan is done when the edges become golden. Very carefully remove the pan and ramekins once done. Refrigerate for at least 24 hours before serving. You'll require a deep baking pan, 6 ramekins, a dish towel, a mesh strainer, a medium-size pot and a small sauce pan. 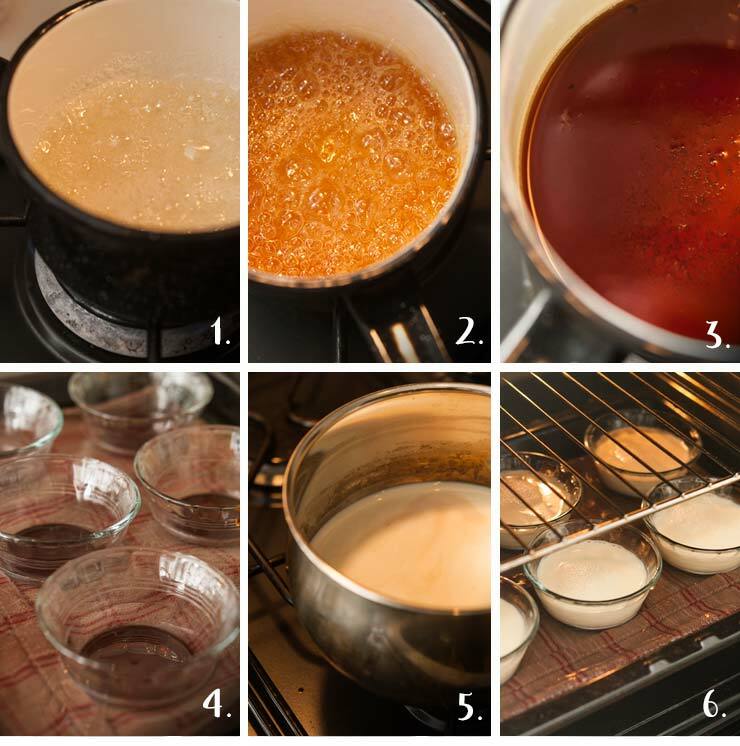 Preferably, you'll want to use a white sauce pan so you can see the color changes of your caramel easily. Create your "bain marie." Lay your dish towel into the bottom of your pan, and place your ramekins on top. Fill the pan with water about half-way up the ramekins. The towel will prevent them from sloshing around in the water. Set aside. Combine 3½ tbsp. of water and 1 cup of sugar in a saucepan to make your caramel. This process will take about 10 minutes. Heat over a medium flame and let it start to bubble. Resist every urge to stir it. (I have a hard time with this. I just want to stir it so much, but it doesn't help). After about 6-7 minutes, the color of your caramel will appear to have a golden blonde color. 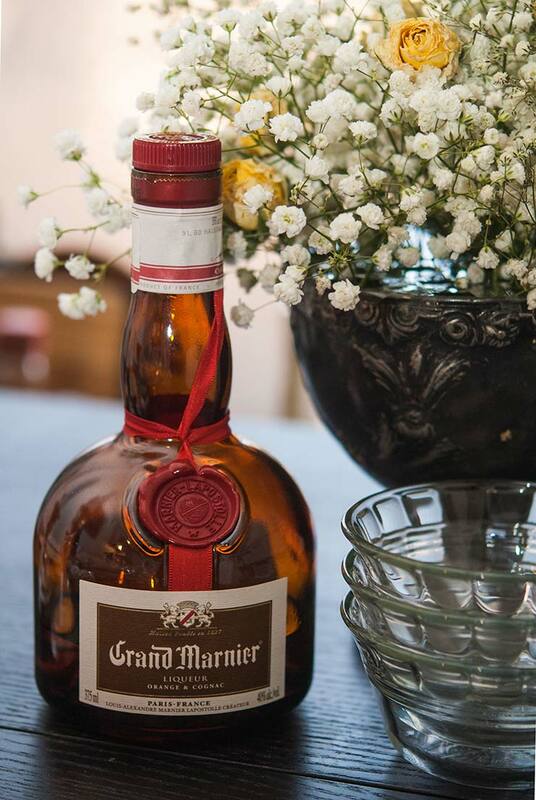 This is when you want to add your Grand Marnier. Pour quickly, pick up the sauce pan and swirl the pan fast. You want it to steam off a bit. Swirl for about 15 seconds, and return the pan to the flame. Watch the color of the caramel closely. When it appears to be darkening to a deep cherry brown, quickly lift the pan and swirl again. The sugar will continue to cook in the pan even when it's not over the flame and burns quickly if it's left too long. Once your caramel is the color of a warm mahogany, pour it into your ramekins. Pour your whole milk and vanilla extract into your pot and heat to almost boiling. Stirring occasionally. Whisk 3 eggs into a measuring cup or bowl with 6 tbsp. of sugar. Pour the sugar/egg mixture through a mesh strainer to strain out any extra eggy bits, and return to your cup or bowl. To ensure your flan is extra smooth, strain the entire custard mixture through your mesh strainer and then pour into your ramekins evenly. Place on the bottom rack, and bake for 45 minutes to an hour. 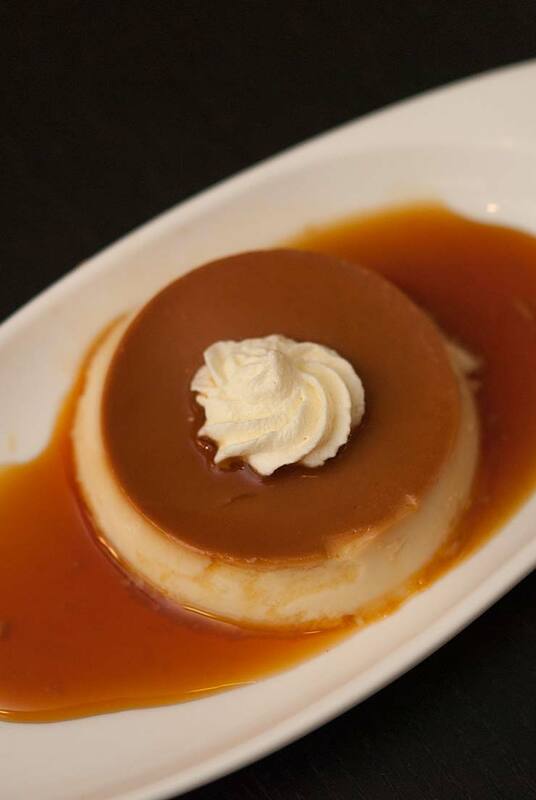 You'll know your flan is done when the edges become golden. Very carefully remove the pan and ramekins once done. Refrigerate for 24 hours before serving. Hello, This is a lovely recipe, thank you for taking the time to write the article. I am a foodie lover and We enjoy making bread and butter pudding.